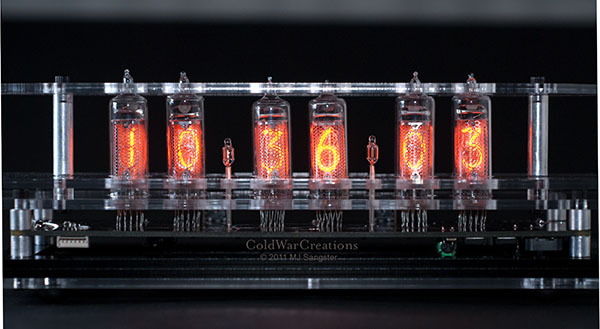 Nixie Clock Strelka (Arrow): A black, silver and clear acrylic Nixie clock. The old is mixed with the new, from Cold War Era Soviet Nixie tubes to surface mount RISC processor of today. The Nixie Clock is designed to highlight the Nixie tube's vacuum tube shape and construction, from the small and unobtrusive circuit board to the clear acrylic case. The heart of the clock is a single circuit board that contains the high voltage power supply, processor, temperature & light sensors, and the Nixie tubes themselves. 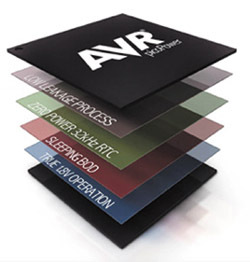 The processor is a very low power RISC based AVR chip. Surface mount components are also used to save space. A watch crystal is used to generate the timing frequency for the clock. It is temperature compensated for higher accuracy. The tubes used in this clock are Russian (Soviet) military tubes. 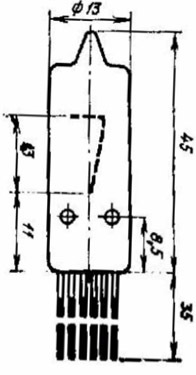 The Soviets, seeing the Western Nixie, came up with their own versions with similar sizes and shapes. Unlike the U.S. Tubes they were manufactured well into the 1980's. Since the collapse of the Soviet Union, these tubes became available on the surplus market. This clock contains the IN-16 series of tubes. These tubes, unlike most Soviet tubes, display the '5' as a unique digit, not an upside down and backwards '2'. The Nixie tube anodes are supplied with 180v from a switching power supply. The tubes are multiplexed 2x3 (2 are on at anytime, with 3 groups of 2), using a pair of MPSA42/MPSA92 transistors. The cathodes are driven with a HV5812 Supertex chip normally used for fluorescent displays. The AVR ATMega168A processor runs at 8 Mhz with a 32khz watch crystal for the timebase. 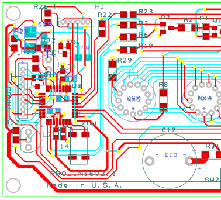 A 4.096V voltage reference and a LM335 temperature sensor are used to temperature compensate the timebase in software. Also, a light sensor is included for the auto brightness feature.